Directed by Susan Lacy, Jane Fonda in Five Acts is a documentary film about the life and career of Jane Fonda as she talks about her life being the daughter of actor Henry Fonda as well as the many identities she took in being an actress, an activist, a workout enthusiast, and many other roles on screen and off screen. The film has Fonda also discuss many things that she encountered as well as aging as fellow actors and other personalities including family members and two of her three ex-husbands talk about the woman who has done a lot and is embarking on a new chapter in her life. The result is a fascinating and touching film from Susan Lacy. The eldest daughter of Henry Fonda, Jane Fonda would make a mark of her own as an actress in film, TV, and theatre but also would take part in other ventures including activism. 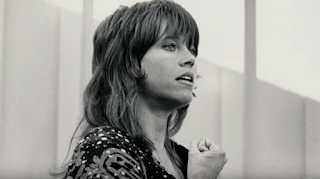 The film is told through five different parts with Fonda discussing many aspects of her life as the four preceding acts all represent the men who were important in Fonda’s life with the first being her father. Fonda revealed that for the image that her father had represented to the public was different from what he was in private as all Fonda wanted from him was to be proud of her. Plus, she admitted to struggle with her early image once she became an actress as well as be the public face of Henry Fonda’s daughter. The preceding acts each represent the three men that Fonda would marry in filmmaker Roger Vadim, activist/politician Tom Hayden, and billionaire/media mogul Ted Turner. All of which would have Fonda discuss their importance in her life as well as giving her a sense of direction and identity but also revealed why the marriage fell apart. When it came to her activism, Fonda knew she was going to get a lot of heat but wanted to contribute something to the world and help people. When it came to the issues in the Vietnam War and her visit to North Vietnam during the war, Fonda does have regrets over the way she put herself into a position as the film opens with an audio recording of Richard Nixon talking about how bad Fonda has fallen and felt for her father. Fonda also reveal a lot of her own faults as a person and as a mother where despite the glowing commentary she would receive from her son in actor Troy Garity and adopted daughter Mary Luana Williams as well as former stepdaughter Nathalie Vadim. Fonda’s eldest child in Vanessa Vadim doesn’t appear in the film as Fonda admits to not being a better mother to her due to her activism and selfishness even though her grandchildren do appear in the film looking at old family photos with Fonda. Then there’s Fonda’s mother in actress in Frances Ford Seymour who had some mental health issues including manic depression that only worsened during her marriage to Henry who would later have an affair with socialite Susan Blanchard who was nine years older than Jane. In April of 1950, Frances committed suicide when Fonda was 12 and Peter was only 10 as there is a scene of Fonda visiting her mother’s grave as it’s a somber moment that shows a sense of loss and overwhelming emotion of a woman who really loved her mother. With the help of cinematographer Samuel Painter, Susan Lacy’s direction is straightforward in not just getting Fonda to speak openly along with members of her family but also friends and fellow actors such as producer Paula Weinstein, Robert Redford, and Lily Tomlin. Tom Hayden also appears as he talks about his marriage with Fonda and why it fell apart yet it is the rare appearance of Ted Turner at his ranch where he gets a visit from Fonda that is the most fascinating. Especially as it reveals there’s still a love between the two but it’s more of a friendship that has them riding horses on fields and watch buffalos. Editors Benjamin Gray and Kris Liem would help Lacy in cultivating many archival interview footage that Fonda did in the past with Fonda commentating on where her head was at the time as well as the films she did as she admitted that some of her performances in her early films sucked. Sound editor Steve Borne would also cover through archives of audio including some of the famous recordings of Richard Nixon who was disgusted by Fonda’s activism. The film’s music by Paul Cantelon would provide a wonderful score that play into the highs and lows that Fonda endured as it is largely a low-key orchestral score. Jane Fonda in Five Acts is a sensational film from Susan Lacy. It’s a film that explores the life of one of the finest entertainment and social figures who is still going to strong while still having things to say. Even as the woman herself dismisses the many myths about herself and her family as well as provide insight into a woman who is complex but also endearing. In the end, Jane Fonda in Five Acts is a phenomenal film from Susan Lacy. Jane Fonda has had such a long and varied career and it sounds like this documentary matches that in style, which is intriguing in itself. And on top of that, it sounds like a very in depth profile and one that isn't afraid to engage in the hard stuff (which contrasts significantly to something like Quincy).